BBC NEWS | Have Your Say | Why did Iran elect Ahmadinejad? Iranians have elected hardline conservative Mahmoud Ahmadinejad as their new president. His run-off with Akbar Hashemi Rafsanjani was billed by some as a fight between the country's reformers and hardliners. BBC correspondents in Tehran say the election has sharply divided Iranian society along ideological and class lines. Do you live in Iran or have Iranian connections and, if so, what have been your experiences of the election? Send us your comments. Not my preferred candidate, but the people have spoken, Ahmadinejad is the new president of our country and we have to respect that decision. I hope he will do as good a good job in foreign affairs as in matters of social justice. I think the Western media have tended to interview young middle class people and have got a distorted view of public opinion. Most people in Iran are quite poor and for them a millionaire like Rafsanjani means nothing. How can people say things such as "the Iranian people should be proud" when female candidates were not allowed to stand? That's not something to be proud of, it's something to be ashamed of. Well done, Iran has showed the world that it is an Islamic democracy and believes in the principles of justice and equality. The elections were free and fair and those who say it is not are just afraid of the success of the Islamic republic. Most Iranians want the Islamic republic, which is shown by the high turnout. I hope, Inshallah, (God willing) Ahmedinejad can deliver his promises of tackling corruption and poverty. Unlike present leaders in UK and USA who apparently have all the power in the world and yet can't even deliver simple promises to its people. Why did Iran elect Ahmadinejad? Why ask this question? Does it matter? Why dwell on his "reputed" ideology? Is his ideology unacceptable? He has been elected as the sovereign head of state of Iran. His ideology reflects that of those who elected him (Iranians). Why not make positive statements about the election process in Iran? Elections do not necessarily mean changes of a fundamental nature. Such fundamental change has to come in the lives of the people of a country first, and is later reflected in politics. It will most likely make no difference at all to most Iranians that Mr Ahmadinejad was elected rather than Mr Rafsanjani. This is Iran's second revolution, showing that they want an Islamic State and system. It is time for the West to stop telling the Iranians what they should want. Also the West and especially USA has to start talking to the majority that count and not a minority who, as I have seen in Tehran, are a very small minority. The US is making the same mistake as before by trying to support a group who are the minority rich against the majority poor and the middle class. I'm sick and tired of people speaking on behalf of the Iranian nation. The Iranian nation has just spoken. Political and social freedom, in view of the election results, are not high on the Iranian people's list of priorities. Battling rampant poverty, corruption and a high unemployment rate clearly is. We experienced eight years of a "reformist" premiership and, frankly, nothing improved on the economic front for the majority of Iranians. If anything, most of us got relatively poorer while a select few lined their pockets. While I do not agree with his policies in general, I'm still eager to see what changes Mr Ahmadinejad rings as his election campaign was mostly built on an anti-corruption drive. As long as the Iranian people have freely made their choice it really doesn't matter what the rest of the world thinks. They will have to live with the results themselves. The rest of the world can and should expect the Iranians to be good world citizens - no nuclear proliferation and no support to terrorists. As an educated and professional Iranian, I am happy that this hardliner is elected. This actually gives me the confidence and motive to leave Iran for good. For couple of years, I was in doubt to leave Iran, hoping to see reforms and improvements. With the foreseen dogmatism coming, I made my mind to leave. Another likelihood is that the ruling extremists would drag Iran's political equation to the extreme, causing turmoil for Iran and the region. I didn't vote in this election. I am really sorry that Ahmadinejad won. I agree with Condoleezza Rice that Iran is moving backwards instead of forwards and I agree with Bush, too, that the non-elected hold a non-free election to strengthen their own power. The Iranians have spoken loud and clear how they want to be governed. If the West finds the Iranian choice unpalatable, they have only themselves to blame. The West's interference, spearheaded by the US, in the affairs of the Muslim world and the duplicitous approach to Iran's nuclear policy has forced the fiercely nationalistic and proud people of Iran to send an uncompromising message to the West which is, "Lay off Iran". Here is hoping that the West got the message. How many Iranians will be thanking Ahmadinejad in a years time I wonder? I suspect that many of the defenders of his election now will be cursing his election in a year. A virtual unknown, but with the backing of the hardline elite comes to the fore and to follow - more suppression of free thinking and individual rights, religious and social policing. This is a terribly backward step for Iran. The revolution might have had a point many years back, but to return to it is a potential long term catastrophe for the promise of Iran. Iran and its people have lost the possibility to regain the position their beautiful country deserves on the international cultural and political scene. I wish that common sense and peace will prevail on both sides. The people of Iran have looked over the border to the chaos and suffering that "freedom" has brought to Iraq and they chose a robust leader to defend their interests and to keep the West out. Good for them, I say. Iran is no different then any other nation, they voted for the lesser of two evils. It happens everywhere all the time when most people really don't like either candidate. I just hope that Mr Ahmadinejad fulfils the aspirations of the Iranian people. Also, that he will be able to bring the ayatollahs to actually talk to the West and ease the tense relations between Iran and the United States. The cries of 'Death to America' have been going on for far too long. This enmity has to stop between the two great nations. What is most worrying for the West in Mahmoud Ahmadinejad being elected is that he is a hardliner. With Iran supposedly developing a nuclear weapons capability, now the country has a hard line fundamentalist who may very shortly have the bomb. This thought is too horrific to contemplate. The outcome for negotiations on Iran's nuclear programme does not look hopeful. At least with the moderate Rafsanjani there was some hope that conflict with the US and Israel could be avoided. Now, I fear we could be heading towards such a conflict in the future if Iran doesn't surrender its nuclear programme. If the US and Western world do not interfere in Iranian life, if they do not attempt to invade Iran, my country's democracy will improve. I believe Islam and democracy can live together. 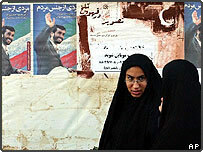 The Americans have described the Iranian election as a mockery due to its flaws. Would they still be saying this if Rafsanjani had won? I think six months ago even Mr Ahmadinejad didn't dream of becoming the president in our country. I was really surprised by the result but I think the election wasn't selecting who should become the president but in fact it was voting for who we don't want as president. I have asked my friends who voted for Mr Ahmadinejad why they voted to him and all they could say was "I just didn't want Rafsanjani to become a president for the next four years". I can assure you that most of the votes for Mr Rafsanjani were because they just didn't like Ahmadinejad. I didn't participate in the second term because neither of the two candidates were ideal. I believe neither Rafsanjani nor Ahmadinejad can improve Iran's situation, but now that Ahmadinejad is elected I'm more disappointed about Iran's future. He is actually a hardliner and will definitely destroy all the positive changes which Khatami made in society in the recent eight years, especially the freedom among the youth and will increase censorship in all aspects. I think the main reason which made people to elect Ahmadinejad was their financial problems. I was in favour of Moin and now that he isn't elected I forecast a bad future for Iran. I hope for the sake of Iranians that the outcome of this election is the right one. It seems there are a lot of young people in Iran who are unhappy with the way things are at the moment. I am an Australian looking in from the outside so I cannot judge the president and the outcome of the election but I hope he does good for the people of Iran and that things don't start going backwards. From BBCPersian.com: Mr Ahmadinejad's election proved that other countries, particularly the Europeans cannot determine our fate. All of them were waiting for Mr Rafsanjani to be elected. Regardless of my political orientation I am glad that Mr Ahmadinejad has won the election. From BBCPersian.com: This election showed that the Iranian society is ill and unpredictable. It is more emotional and less rational. The nation and the elite went their separate ways. From BBCPersian.com: It seems that in spite of a few cases of fraud, Mr Ahmadinejad won the election based on broad-based support and thanks to extensive discontent about the current economic situation. From BBCPersian.com:The result of the election was affected by the people's financial problems, a dislike of cleric figures as presidents and widespread dissatisfaction with corruption. It is shocking to see people of Iran electing an ultra-conservative fundamentalist as their president who wants to take the country back to the medieval ages. At the same time, in democracy, the people's verdict is supreme and the US should respect their choices rather then finding flaws with the election process. Iran elected Ahmadinejad because I think firstly, he represents the poorer sections of society who voted for him and secondly, Iran wanted to send a message to Western nations to stop interfering in their country. It's deeply hypocritical that the Americans tout a blatantly flawed and forced 'election' in occupied Iraq as a success, while they criticise the people of Iran for making their own choices. The West has a colonial mindset about these things. If you want democracy then you have to respect the election results and not make excuses just because you don't like the person the people elected. I wish Ahmadinejad success and hope that he is able to tackle to corruption in the civil service and government that he talks about. Rafsanjani probably holds more power than anyone in Iran after the Supreme Leader, due to his position on the Expediency Council. So allegations of election irregularities would have been more plausible had he won. The result shows the distance between Western commentators' knowledge and average Iranian opinion. I think everything is just a play! They are just leading us to act in this play and we are just acting like puppets and nothing more than that. As I read the messages about Ahmadinejad I understand that they brainwashed the people's minds so I don't know what to say. I can't believe something good will happen until it really happens and I hope that we won't lose our social liberty. Ahmadinejad's victory does not bode well for the Iranian people. I've been to Iran several times and have been impressed by the humanity of its people - you only have to notice how many toy shops there are in Tehran to realise the decency of Iranians. However Ahmadinejad's hard line crackdown on "Western decadence" - closing cafes, forcing beards and long sleeves etc shows his contempt for any view other than that of the mullahs. When the oil price falls Iran will be forced to reform - peacefully I hope. Unfortunately this victory makes that less likely. If Mahmoud Ahmadinejad is the choice of the Iranian people, so be it. It is their choice on who they would like to lead their country and they have given their overwhelming support through the ballot. So let's not say that he's necessarily bad for Iran or for the rest of the world. Let's not forget that there are many negative opinions about George Bush Jr too and he is just as democratically elected as Ahmadinejad is. This man will plunge his country into darker times and help perpetuate a religion that subjugates women. Poverty and unemployment will continue under him. Until Iran realises it must make fundamental changes, the economy and the people at the bottom will stay exactly the same as it is now. Within a year, there will be crackdowns on freedom of thinking and maybe even war with other counties when he pursues nuclear weapons, which he will. I am sure many events and considerations affected this election of which I have no knowledge, but I have no doubt Ahmadinejad greatly appreciated being condemned by Bush for boosting his credibility and stature in Iran. This is a sad chapter in recent Iranian history where in the worse case scenario, the populace have voted for a more extreme case of totalitarianism than is currently present. I am against any system of government which limits free-thinking and imposes nonsensical values and rules upon the populace. This act alienates the Iranian people from the rest of the world and places a cultured and pragmatic people, who have long been the link between cultures, in line with an extreme form of doctrine which has no place in a modern world. I fear for the future of Iran and for the future of Iranians. Today Iran need an economical reformer. Ahmadinejad is the one we need. The one who links all hardliners to reformists. The one who bring light in our politics, as we needed Khatami as a cultural reformist before. I think its wrong to judge the new president before he has even taken office. The one thing that is crystal clear is that Iranians don't take too kindly to other countries telling them what they can or can not do or have. Phrases such as "reformist" or "ultra-orthodox/hardliner" cut little ice now. I think its wrong to judge the new president before he has even taken office. Only time will tell whether the new President can deliver on his promises. That's the important issue to Iranians and that's what we are looking forward to. One of the most important tasks for Iran is to continue building their economy (for the sake of jobs, infrastructure, and technological development). However, with the election of Ahmadinejad, I fear that foreign investment in Iran will be deterred and Iran's fragile economy will struggle. The people of Iran have a new political leader, a choice freely made whether Bush likes it or not. The people voted for improvements in their own lives, that's all most people ever vote for. They want a better life for themselves and their children. To a large extent they voted for a change, for some honesty and an end to corruption and the rich/poor divide. Ahmadinejad campaigned on a platform of reform and the elimination of corruption. He wants to make the lives of the poor better. What a terrible tyrant he must be! Its time to engage with the people of the middle east. Rice betrays the US motive in its middle east meddling by demanding democratic elections then implying the man duly elected is a dangerous extremist and a threat to mid east stability. We must fear him because he was elected with the assistance of powerful, wealthy sponsors and fundamentalist religious groups. I hope Ahmadinejad's victory can be interpreted correctly. He won because he promised to fight against the economic mafia. It does not mean that people vote for fundamentalism. The elections in Iran seem to have been as fair as in any democratic country. The outcome may not be suitable for some countries' interests, but that is not a factor that should dictate the level of fairness of elections. The people of Iran have spoken and the rest of the world should accept what those people want for themselves, as simple as that. The election is over and results are announced. I was sad to see that the person I had cast my vote for has not won but there is one point - the election was free and fair. These are interesting developments but also very worrying. It should be obvious that Ahmadinejad poses a problem as far as international relationships with Iran are concerned. In fact, even Rafsanjani was considered a problem up to two weeks ago. The Iranian election was free, fair and successful. The turnout for voting was significantly good and Mr Ahmadinejad winning more than 60% of the votes in the second round should show the world, especially the West, that there are still a majority in Iran that support the Islamic revolution and Khomeini's ideology. I am very proud and happy for the results and my nation. The results of the election clearly and unequivocally attest to the loyalty of the Iranian nation to the fundamental principles of the Islamic revolution. Go Ahmadinejad go! Fear. It's one reason which shadows any reasonable thinking. Last year, US election was dominated by fear related to moral issues - fear of making abortion legal, fear of allowing gay marriage, and fear of taking soft stand against terrorism. In Iran, it's fear related to religion and security - fear of opening the country to the Western world, fear of not pursuing the nuclear option, and fear of not doing enough to protect Muslims in the world. In other words "I will vote for you if you rule by Islamic laws". From the beginning I knew Mr Ahmadinejad was going to win. Unfortunately many Western media/ Iranian Diaspora seem not to understand that the borders of Iran do not stop at the limits of wealthy/ westernised Northern Tehran suburbs. Outside that rich "enclave", Iran is a totally different country where the citizens (many of them poor) have other expectations from the government than the freedom to enjoy a more secular westernised way of life. This calls for celebration! May God grant Mr Ahmadinejad the power to make Iran a better place. I have absolute faith in him and his principles. While I am disappointed by the Iranian choice of Ahmadinejad as President, I think it is important to remember and reflect on the fact that though we in the West may collectively believe Iran is nothing more than a dictatorial theocracy, they do have their own democratic process and we must respect and commend them for that. And let us not forget that under the American-backed Shah, anything relating to democracy was (sometimes ruthlessly) repressed. I am really appalled at the way things have turned out for most Iranians. Their choice was either conservative or ultra-conservative. Clearly the latter has won. A bad day for democracy in Iran. I am happy at the outcome of the elections. First, the Iranians have shown that the USA and other Western powers will not improve the economic or social conditions of the Iranian people. Secondly, Western propaganda is always against an individual who has the national interests at heart. This election just goes to show that the liberalising/Westernising trend amongst young Iranians was confined mostly to the educated and wealthy Tehran elite, and was not shared by Iran's poor. What a splendid result! The US has its face slapped again as Iranians pick a man who will do everything to remove American influence from the entire region. A proud Iran will not be defeated. Let me say to all the guys who criticise Ahmadinejad, that you guys are not the representatives of the entire Iranian nation. If they like Islam and Islamic justice it's their choice. We're fed up with groups talking on the behalf of the Iranian nation. Afterall as a student who's lived half of his life in the Western countries I've got to say things are not that bad in Iran in comparison with the rest of the world. I was sad to see that the person I had cast my vote has not won. But there is one point: election was fair and free. Those who are sitting outside the country and see nothing except those around themselves have no right to interfere in our country. Though Mr Ahmadinejad was not my favourite candidate he was elected and I respect him as our president. We cannot judge him before he comes into power and acts. The US also should keep out of this country and mind its own business. I am an Afghani. In my point of view Iran presidential elections showed that people who are living under the shadow of poverty are more interested to bring changes to the structures of the governments which leads by some politicians who are playing role for their own benefits, and people always seeking justice to find out their rights. And I think the real democracy is to pay attention to majority people demands, so when people elect their own president others should respect the majority. I think everything will change with this unexpected result but I think Dr Ahmadinejad is more better than Rafsanjani. I think he will improve things in our country. The turnout in the north part of Tehran is much higher in this round. I am so proud of all the Iranian people who, instead of boycotting the election, have taken part and voted. Viva Iran. From BBCPersian.com: The turnout seemed higher in the runoff election. There is a serious competition going on and it is difficult to tell who will be Iran's next president. From BBCPersian.com: I spent some 30 minutes waiting for my turn to vote. I wish to thank all Iranians for their solidarity. From BBCPersian.com: In Mashhad (north-eastern Iran) youngsters were voting rigorously. There were as many voters as there were in the first round. From BBCPersian.com: At 10 am the polling stations were crowded. Most people voted for Ahmadinezhad. The turnout was higher than the first round. Some people had to drive for five hours to reach to the polling station in Masqat. And there was no violence. From BBCPersian.com: There were more people voting in the runoff. I am proud of this nation. From BBCPersian.com: The turnout is way lower than the first round in Orumieh. There were less than four people in many polling stations at 11 am. From BBCPersian.com: There was less interest in voting this time round. I hope more people will turn out in the afternoon. From BBCPersian.com: I hope more people would turn out at the polling stations to prevent a catastrophe. From BBCPersian.com: Fortunately turn out is as good as last round. I hope Mr Ahmadinejad wins. Incidentally, for those who have given up their senses and believed rumours around him (that Ahmadinejad will take all social freedom from us) I think this has been made up by those who see their powers at stake. From BBCPersian.com: I did not vote in the first round and I haven't made up my mind on this round as yet. But it seems that in this election only the candidate will come out victorious that is more skilful to win sympathy vote. From BBCPersian.com: Here in Rafsanjan (Mr Hashemi's home town) a lot of people have voted for him. I voted for him not because we come from the same town but because I want to stop fascism. From BBCPersian.com: I was at the polling station at 10 this morning with only 10 other people. I saw some people heading for the polling station. I hope whomever wins this election sticks to his words. I am 19 years old and I have never voted in Iran. I love my country but I hate my government. The Iranian election is not free and fair and I hope Iranian don't vote to for either Akbar Hashemi Rafsanjani and Mahmoud Ahmadinejad. I think that Iran should lean on the side of Mr Rafsanjani. Though I will admit, I am not completely familiar with his first presidency term, I do believe he will be a better choice. A man like Mr Ahmadinejad with strict Islamic views and values seems more likely to further deepen Iran's former suffering. As an Iraqi Kurdish citizen having lived in Iran for 16 years, I should say the elections are no more than a puppet show. The Islamic regime that has lost popular support is now seeking to renew itself by playing a new trick. The problem is that the whole process is a rigged one with the Guardian Council exercising too much power and it doesn't matter for the Supreme Leader who gets elected since all of the candidates have already passed through filters. Iranian people are now completely disillusioned with the Islamic regime and the low vote-turn out proves this. The authorities have this time allowed teenagers to take part in the elections, because they are sure adults will not vote and are seeking the votes of hot-minded teenagers, many of whom just like to vote because it's their first chance of voting. I had gone for run-off voting this morning. In spite of our expectation, many people gathered to cast their votes. I think we will see another massive turn-out. It seems that Mr Ahmadinejad will win the election. We were all shocked. Nobody can predict the election, as the showman mayor has much clout in less educated people and lower economical groups. I am sure Ahmadinejad will reverse our slow development process and make so many enemies for us in the world without achieving anything. He is too immature for such a high position and is mainly supported by hardliners. I vote for Hashemi, despite my criticisms of his previous views and actions. I am not at all shocked with the results. I, along with other members of my countrymen could easily predict the outcome of the elections a few years ago. That is because these elections are rigged as always. I voted for Mr Moin last Friday and was terribly shocked by the result. I believe the elections were rigged, but it couldn't have changed the final result. The fact that Mr Moin came fifth in this election and someone like Ahmadinejad who hasn't even pretended to be a pro-reformist and liberal candidate, means that the obsession of the majority of the Iranians is far from Human rights or democracy. You can attract their vote with a totally unclear perspective of social and economic justice - that's what they are looking for. If we look at the family structure of Iran, it is very easy to understand that the election process is based on the Iranian understanding of democracy, which is 99% dictated and one percent respect of an individual's point of view! When America held the Shah in power, there were no elections. We must let the people determine their own fate. Freedom is not an exportable commodity. It is really a sad time to be an Iranian. This is especially true when reading comments from radical and presumably "neo-con" expats who want to see Ahmadinejad as president. These people want to see Iran become even more hard-line and repressive. I can see them relishing the thought of a fascist and incompetent president, giving them further justification to flood the internet and air-waves with the most horrific anti-Iranian and anti-Islamic propaganda. In my opinion, these Iranians living abroad are far more dangerous than the Guardian Council and the Islamic fundamentalists. In some Western countries such as the UK and USA we have limited choices. In Iran there were eight, all with very different ideas and plans for their country. And with the run-off you have two very different directions for Iranians to choose. Which is more democratic Iran or the UK/US? The answer is up to you. These elections are truly a measure of how sophisticated Iranian society has become. The campaigns pit against one another the segments of society that see different futures for the country. The elections are a credit to the Iranian people who have chosen the ballot box rather than violence to solve their differences. All the Iranian people should be proud. The election is a sham, the real goal of the regime is to scare people into voting for Rafsanjani. This was all planned by the regime with the help of the military. A message to all the Iranian expats encouraging people to reject the election, rise up and change the regime: Why don't you leave your comfortable lives in the West and go back to make a difference? It is so easy to shout from the ring-side. If everyone had stayed away from the polls in the first place, the so-called boycott would have sent a clear message to the regime and the whole world. As it is, a huge number of people who have never known anything other than this regime have decided to allow two men who will bring no improvement to Iran to fight it out. Neither candidate cares about the future of the country; they are both using the tactic of promising a better economic future to a country that has vast natural resources but has mismanaged them through years of corruption. Until the people of Iran act on a united front they will continue to be both politically and economically cheated. The only good that can come out of this election is that Ahmadinejad will get in, bring in increasingly hardline policies and force everyone to wake up and smell the coffee. The situation within Iran appears to bear much similarity to the US' own choices. Change and interaction with the world or inward looking and failing to engage with the world. There is of course a huge difference in economic muscle and influence. The US took a step back from the world with the re-election of Bush, it is to be hoped that Iran, always on the point of showing much promise, takes the step forward and engages with the world and reforms. Eight years ago Mr Khatami promised reform and then spent four years saying 'I would if only I could'! He stood again for another term going on TV shedding tears and complaining that despite having encouraged many people to speak out and seeing them end up in jail without giving them any support, he would really try to implement the reforms next time. So people flocked to the polls once again to choose him. Now, with the reformers disgraced and the Islamic regime completely discredited, they have pulled another trick out of the hat. Mr Rafsanjani, who is already the selected 'president' would have been hard to sell to the public due to his dismal record, so they have introduced a bogeyman (Ahmadinejad) in order to make Rafsanjani look more palatable. As always, the people of Iran will fall for the trick. Never mind vote rigging - the whole process is one big fraud! I am a British and Iranian citizen and I am going to vote Mr Rafsanjani, my reason being that at present he is one of the powers of this regime that can make changes as he stated in his interviews. Besides, he is the only hope to pursue any progress with the West. He is the hope of moderates for a better Iran. For the first time in 28 years I'm breaking a personal taboo by voting for Rafsanjani tomorrow. This is not for the love of Rafsanjani but for God's own monumental fear of having a thug as president. Rafsanjani has promised prosperity and issue of free shares in privatised state companies. In 1979 Ayatollah Khomeini promised free gas, electricity and water for the people, which never materialised. Why should anyone believe a single bit of Rafsanjani's promises? The Iranian people are surely more clued up than that. While Iran's government is clearly non-democratic, this election is a move towards democracy. Westerners must recall that full democracy in the West was not achieved overnight. This sort of thing takes time; people must be patient and wait to see what the result is. Hopefully, Iran will move towards a fully free society. The next president should be the one who takes care of the needs of the people, especially the poor and those struggling to make ends meet. At this point it doesn't matter who wins the election. Neither candidates will have the power to bring the changes to the economy or give more freedom to the people. If anything, the country is taking a big step back, and the only people who can stop this from happening are the Iranians themselves. The choice is between bad and worse. But it is sad to see, that people are going to choose bad. We should boycott the election. No one has deserved to live under those conditions. I am very sad to see the majority of Iranians still can be so easily misled by the regime's propaganda. Nobody can deny the fact that this country is only run by a certain mullahs who never been elected. While men and women there still can't enjoy a basic level of freedom, some people here turn around and defend this show of vote-for-one-of-my-selected-puppets as democracy. Wake up for goodness sake!. The huge majority of people know this election is a sham and the regime will declare whatever winner they intend to declare - the votes of people don't count. Besides, the president is a puppet anyway. The Iranian people will not vote again and therefore by doing this they will show the world that we reject this system and we want a new free, secular and democratic regime. Democracy and an appreciation of one's democratic rights do not happen over night. Iranian people are taking their first steps on a long road that will hopefully one day deliver a truly representative government. I would never be wiling to vote for such an election when I do not believe in its principles at all. But since last Friday I've had several conversations with some of my young friends inside Iran which made me think twice. A young friend told me: "It is the worst thing happening to me to find that we do not know our own people yet. Friday proved there is still a side of society that we don't know!" She said she was so disappointed that she did not vote for Moin and now she has to vote for Rafsanjani! I can't even imagine Ahmadinejad running the country and I can't understand why did people trust the untruthful promises such as a general monthly salary for everyone!" Even if Mr Ahmadinejad wins the presidency, Mr Rafsanjani, being the second most powerful man in Iran, will still be in charge. He won't lose anything. This election was a big shame and a childish way of cheating. What Iran needs is the change of the regime - Iran with no mullah governors. I hope Ahmadinejad becomes the next president. If the people of Iran do not know when to stand up for their rights, let them get what they deserve - a hardliner to knock some sense into them. I exercised a ban on the last ballot and will do so this time, too. It is not a choice, not this between a hardliner and a former hardliner who is now trying a new image. In a way, it is better if Ahmadinejad wins, for at least he is so obviously hardline and difficult that finally something might change. The main danger with Rafsanjani is that he'll pretend to ease relations with the West, while the people remain oppressed and worse off economically. Once again, the Iranian people have lost. An outstanding performance by the fundamentalist regime has left the Iranians to choose between two hardliners - Rafsanjani and Ahmadinejad. Well done to all Iranians inside and outside Iran who voted on 17th June. This is another sign that not all the Iranians are ready for a change yet. I sincerely hope that Mahmoud Ahmadinejad wins the election. There is just too much corruption and I think that Mahmoud is ready to do the job. He will make a good president for Iran, because he will try to eliminate all this Westernisation which the Shah brought upon this country. The election was a fraud. All these candidates were selected by the Guardian Council in the first place. There is no election with no selection. As long as the council exists there will be no free election in Iran. Change is inevitable. I didn't take part in the first round but the nightmare of Ahmadinejad as Iran's president makes me vote against him in the second round. I do not think the situation is as bad as many say. I believe the main problem is that we have initiated our path toward democracy but lack required patience. Remember the leading democracies were achieved through hard and long struggles of many generations - this was the reason I participated in the elections despite many previous disappointments. Iranians should come out in full force, for the run-off, on Friday. Despite a common belief that casting a ballot will add legitimacy to the regime, voting on the second round will, only, demonstrate to the outside world that the people of this nation are against extremism and fanaticism and are tired of revolutionary rhetoric. Unfortunately, with the current choice of candidates, it's a case of choosing the lesser of the evils. Khatami's eight year presidency clearly demonstrated that the powers bestowed upon the elected president are extremely limited. The real power in Iranian politics lies with the 'Guardian' and 'Expediency' councils, and with one man in particular, Ali Akbar Hashemi Rafsanjani. Pragmatically, we might as well have a president who has real power, so it might as well be Rafsanjani. It's certainly better than having a hardliner like Ahmadinejad and it'll be a novel thing for Iran to have a president whose words mean something, even though h may not mean what he says. I think what people fail to realize is that it doesn't matter who gets elected in Iran. Their government is controlled by the Supreme Leader for life and the president is just a figurehead who has to bow to the wishes of three different groups of people before his ideas even come into play. If the vote was rigged it was for the benefit of the Western media to harp on about it and draw attention away from the fact that as long as Khamenei is the leader there will be no change at all in the way Iran is governed. The result is a huge blow to the democratic movement that began in Iran some 8 years ago. Ironically those groups who boycotted the elections in the name of democracy have harmed it the most. It is now time to put differences aside and support Mr Karrubi's calls for a recount. In some Western countries such as the UK and America we have two choices, some would say no choice at all. In Iran there were seven, all with very different ideas and plans for their country. And with the run-off you have two very different directions for Iranians to choose. Which is more democratic Iran or the UK/US? The answer is clear. Iran is the perfect example of why Bush and co are not really interested in democracy. Iran has a democratic system that is pretty much as democratic as many Western systems including the UK (remember the House of Lords!). It's just that their version of self-selected democracy does not serve the interests of the US and their allies. There is an Iranian saying which says, a snake will never give birth to a dove and this is exactly the case with the situation in Iran right now. This regime has to be changed from the roots. Who thought Khatami would bring reforms? Look at Iran now. As Iranians we have always been divided by politics but I think this election showed that the Iranian nation are united on one front: We want regime change. Who can dare to ask for a fair election, when everything will get changed by a single proclamation from Khamenei, supreme commanding leader? Islamic fundamentalism has many factions and interpretations. In order to keep the peace amongst themselves, the Islamic ruling theocracy subjects its chosen players to a public vote comfortable in the knowledge that irrespective of who is chosen the theocracy's divine right to rule over its subjects will remain intact. This time around, the ardent hardliners who have managed (during the past eight years) to gain the upper hand over their more moderate opponents within the ruling clan, have decided to eject their more troublesome comrades from the corridors of power altogether. As always, I am boycotting this farce because it insults my intelligence. The vote rigging came as I expected. My prediction is that the vote rigging will be wholly or partially rejected and Mr Rafsanjani will face the mayor of Tehran in the run off. The result of the run off will be, I'm 100 per cent sure, Mr Rafsanjani in the office. Like many here in the West. I am confused about the will of the Iranian people. They all seem to understand what it means to be free, yet allow themselves to be ruled and herded like sheep into these puppet elections... either you have freedom or you do not. When a religious zealot is allowed to rule over your decisions, there is no freedom! Wake up people of Iran! Go and take hold the freedom which every person on earth is entitled to. Why should I care who will be the next president of Iran when women can not legally decide where to live, whom to marry or what to study when they do not have the right to get divorce, all based on our so-called constitution law? The best of our presidents promised to act according to such law and we praised him for saying so. Mullahs do not like my wisdom, my opinion, sometimes they even don't care about my existence. Why should I care for such regime? Talking to many Iranians in the past couple of days, I have learnt that the majority of the people went to the polls on Friday to give their votes for the bad person just to stop the worse one to be elected. I think this is really a pity when we all know the tyrannical regime of mullahs is using these votes to prove its legitimacy against us Iranian and the entire world. I want to ask my country mates - does it really matter who becomes the next president when, literally, he won't have any power? I am tired of the media stating that Iran's youth will not vote, I am 19 and I voted, I also know many others like me in Iran that also voted. I don't believe that the elections are a sham. For those who say that the choice of candidates are limited and they have been hand chosen, do you expect 1,000 candidates to be on the ballot? In the United States only two candidates stood and the candidates are not fully chosen by the people, does that make the US elections a sham? Also some say that none of the candidates share the people's views, many people in the UK did not agree with the war on Iraq but in the elections both of the main party leaders who had a chance of becoming prime minister where in favour of the war on Iraq does that make the United kingdoms elections a sham? I cannot exactly predict who is going to take office in Iran. But I can assure you Iran is moving on the right tracks to democracy. Iranian people have paid a lot so far, ranging from the US backed eight-year imposed war to the natural disaster of Bam earthquake. I believe the results of the elections, if no irregularities are found, show more than anything how out of touch the Iranian intellectuals and reform minded people (me being one of them) are with the core of Iranian society. I believe the fact that most of the predictions have turned out to be incorrect is due to the fact that they were based on the opinions of a small sample of Iranian society, from middle class or upper middle class sections of large cities. None of the domestic or foreign news sources have access or even attempt to gain access to the Iranians with lower levels of income or education or the ones living in rural areas or small towns. Therefore their thoughts are almost never reflected in the media reports. Since it is common knowledge the Islamic clerics run Iran, the elections are for who gets to be the puppet. If the election turnout is 10% or 90% it doesn't really matter. Iranians are not electing anybody of any importance. The clerics can allow such a "democratic" process to take place. Of course, a hardline puppet would be useful to the clerics so measures will be taken to ensure a hardliner victory - someone to remind the Iranian people how righteous and holy the clerics are. It's surprising to see the Western media painting the election as a manipulation by the what they consider "hardliners" before the election. Now that the people have voted, and it seems that many of the "people" are behind what the West considers "hardliners", they quickly paint a picture of moderates needing to gather together to vote out the hardliner. It's clear the Western media is not in the slightest bit interested what the Iranian people want, they just want someone who can be easily manipulated for Western interests.